The judge said a three-judge panel should hear the arguments. RALEIGH, NC (WTVD) -- Gov. Roy Cooper and the North Carolina NAACP will have to wait a bit longer to learn whether a temporary restraining order will be granted by the courts. Both are petitioning the measure in response to two amendments slated for the November ballot, that they call, misleading and unconstitutional. On Tuesday, Superior Court Judge Paul Ridgeway declared that a three-judge panel should decide the matter. 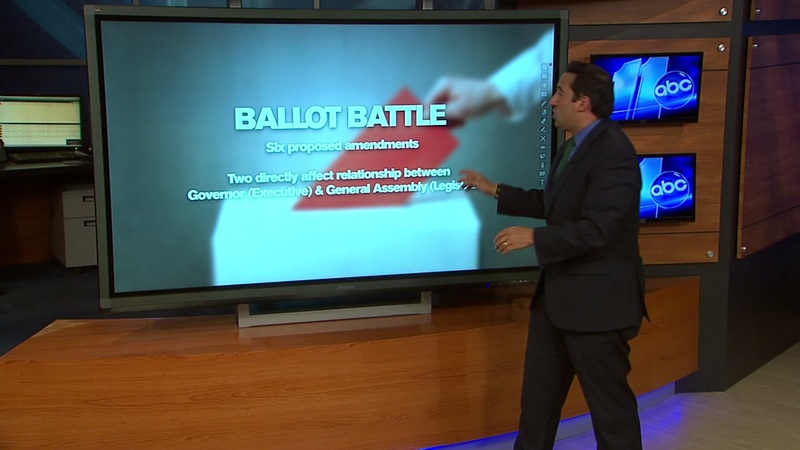 Cooper is suing the General Assembly to keep two amendments from going before voters. One question asks voters to decide on a "Constitutional amendment to implement a nonpartisan merit-based system that relies on professional qualifications instead of political influence when nominating justices and judges to be selected to fill vacancies that occur between judicial elections." It's easy to get lost in the weeds, especially when the current events of North Carolina's state government more likely resemble a thicket of partisan platitudes and judicial jargon. That question would essentially take away power from the governor to appoint judges. "We believe those descriptions are false and deceptive and that people's constitutional rights have been violated," said Cooper. His attorney additionally argued in court that the amendment language is discriminatory. "Both of them would take a wrecking ball to the constitutional separation of powers principle," said Cooper's attorney, John Wester. "No general assembly has ever dared to do what this one will." An attorney representing House Speaker Tim Moore and Senate Leader Phil Berger said the legislature has the ability to draft amendment as it sees fit. "I don't understand what kind of standard we're supposed to apply to that," said Martin Warf. "There's no case law in North Carolina that evaluates the stand for the ballot language of a constitutional amendment." A spokesman for Moore said Cooper is using the court system to make end runs around lawmakers. "Political litigation is the governor's idea of leadership, and the people of North Carolina are becoming accustomed to Cooper's use of the court system to circumvent their support of popular legislative proposals," spokesman Joseph Kyzer said.